at her front door, sheâ€™s certain itâ€™s meant for her. Never mind to whom itâ€™s addressed. She unties the green string and tears open the simple brown paper to reveal a loomâ€”a golden magic loom. 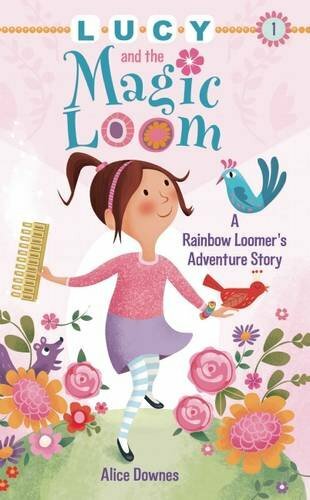 The magic loom leads her to a dusty bookcase and through a secret passageway, into an enchanted world.This new world is filled with fantastic creatures, castles, and vast, colorful landscapes. Lucy quickly encounters several challenges that she can only overcome with the help of her loom. Sheâ€™ll need to build a bridge, distract a giant beast, fly above an entire forest, and rescue a girl trapped in a castle.Lucy will have to use her imagination and a lot of creativity to come up with solutions that will work. She must focus on her mission and never give up, even when things seem impossible. This story rewards kindness and generosity, and emphasizes the importance of friendship and helping others. And for any young reader who loves the Rainbow Loom, this is a story to get them excited about reading, too! Discover a new adventure series with Rainbow Looms!